From the Section of Biochemical Genetics (R.C.A.-N., N.S. ), Division of Human Genetics (R.C.A.-N., M.A.D., A.B.W. ), Department of Pathology and Laboratory Medicine (L.K.C., A.B.S., A.N. ), Division of Child Neurology (E.D.M. ), Children's Hospital of Philadelphia, PA; Department of Pediatrics (R.C.A.-N., N.S., M.A.D., E.D.M.) and Department of Neurology (E.D.M. ), Perelman School of Medicine, and Department of Clinical Pathology (L.K.C., A.B.S. ), University of Pennsylvania, Philadelphia; GeneDx (J.J.), Gaithersburg, MD; Neuroregeneration and Stem Cell Programs (G.K.E.U., T.M.D., V.L.D. ), Institute for Cell Engineering; Departments of Neurology (G.K.E.U., T.M.D. ), Solomon H. Snyder Department of Neuroscience (T.M.D., V.L.D. ), Pharmacology and Molecular Sciences (T.M.D., V.L.D. ), Physiology (V.L.D. ), and Public Health (E.M.), Johns Hopkins University, Baltimore, MD. Objective: ATAD1 encodes Thorase, a mediator of α-amino-3-hydroxy-5-methylisoxazole-4-proprionate (AMPA) receptor recycling; in this work, we characterized the phenotype resulting from ATAD1 mutations and developed a targeted therapy in both mice and humans. Methods: Using exome sequencing, we identified a novel ATAD1 mutation (p.E276X) as the etiology of a devastating neurologic disorder characterized by hypertonia, seizures, and death in a consanguineous family. We postulated that pathogenesis was a result of excessive AMPA receptor activity and designed a targeted therapeutic approach using perampanel, an AMPA-receptor antagonist. Results: Perampanel therapy in ATAD1 knockout mice reversed behavioral defects, normalized brain MRI abnormalities, prevented seizures, and prolonged survival. The ATAD1 patients treated with perampanel showed improvement in hypertonicity and resolution of seizures. Conclusions: This work demonstrates that identification of novel monogenic neurologic disorders and observation of response to targeted therapeutics can provide important insights into human nervous system functioning. Clinical exome sequencing is becoming a standard of care for patients who remain undiagnosed after extensive diagnostic workup. Although exome sequencing reveals a diagnosis in 25%–40% of patients,1,–,3 obstacles continue to prevent genomic medicine from wide-spread use. Challenges include understanding the effect of gene variants on disease4,5 and using genomic information to improve an individual's management. We report an example of how these challenges can be overcome and, concurrently, describe a monogenic disorder caused by recessive loss-of-function ATAD1 mutations. Affected neonates demonstrate progressive extreme hypertonia, encephalopathy, and seizures. ATAD1 encodes Thorase, an AAA+ ATPase that internalizes postsynaptic α-amino-3-hydroxy-5-methylisoxazole-4-proprionate receptors (AMPAR). AMPAR bind the major excitatory neurotransmitter, glutamate. Activity-dependent insertion and removal of postsynaptic AMPAR are integral to learning and memory.6 In ATAD1 knockout mice,7 loss of Thorase decreases internalization of AMPAR, resulting in increased postsynaptic receptor density, excitatory neurotransmission, excitotoxicity, and neuronal death. ATAD1 knockout mice have seizures and die between postnatal days 19 and 25. Given the similarity between mice and humans lacking functional Thorase, we designed a targeted therapeutic approach using the AMPAR antagonist, perampanel,8,9 and found that it improves behavior and survival in mice and eliminates seizures and improves tone in patients. Further information can be found in the supplemental methods at Neurology.org/ng. The objective of this study was to first identify the etiology of the subjects' hypertonia and seizure disorder using exome sequencing and autozygosity mapping. Once the ATAD1 mutation was identified, the next objective was to evaluate the efficacy of the AMPA receptor antagonist, perampanel, in both a mouse model of ATAD1-associated disease and human ATAD1 patients. For mouse behavioral and imaging studies, a group size of 6 was chosen so that given an SD of 10%, an 18% difference in the mean values between the 2 groups could be detected with a power of 80%. The sample size for the human studies was determined by the number of available patients and family members. The human therapeutic trial was an open-label single-center compassionate use trial in the 2 affected patients. Because of technical limitations, the study was not randomized or blinded. Clinical improvement in the patients was measured using the Functional Status Score, a validated pediatric outcome measurement,10 see supplemental methods for more details. Animal experiments were performed in compliance with the regulations of the Animal Ethical Committee of the Johns Hopkins University Animal Use and Care Committee. For human studies, written informed consent was obtained for the trial and for publications of photos and videos. The study was approved by the Children's Hospital of Philadelphia Institutional Review Board. The use of perampanel was approved through a Food and Drug Administration (FDA) emergency investigational new drug application. Mouse imaging and behavioral data are graphed as mean ± SD. For statistical analysis of MRI results, distance calculations, and rest measurements, one-way analysis of variance (ANOVA) was performed followed by a Tukey post hoc test to compare mean values. For open-field analysis, a 2-way ANOVA followed by a Sidak post hoc analysis was performed. Multiplicity-adjusted p values were calculated. For survival analysis, a log-rank (Mantel-Cox) test was performed. Identification of recessive loss-of-function ATAD1 mutations. To obtain a diagnosis in a large consanguineous Kuwaiti family with multiple neonates affected with hypertonia, seizures, respiratory failure, and death (figure 1, supplemental results), we used clinical exome sequencing and single nucleotide polymorphism (SNP)-based homozygosity analysis. The proband (individual IV-6, figure 1) was symptomatic at birth and presented to our center at age 9 months. He was nonresponsive to tactile, visual, and auditory stimuli with no spontaneous movement and extreme hypertonia. EEG at 9 months showed hypsarrhythmia, a chaotic interictal pattern suggestive of severe brain dysfunction. He did not demonstrate infantile spasms as his extreme hypertonia precluded almost all movement. Brain MRI at 2 months of life was normal, but repeat at 9 months showed marked interval reduction in cerebral volume. Prior investigations (table 1) were unrevealing. The proband is patient IV-6; his cousin who was subsequently evaluated and treated is patient IV-3. The ATAD1 variant, p.E276X, was identified by whole-exome sequencing and tracked with disease in all available family members (+ represents the normal allele and − represents the p.E276X allele). See also figure e-1. The second patient was the proband's 2-month old male cousin (individual IV-3, figure 1). He also had a history of hypertonia and clinical seizures at birth. On first evaluation at our center at 2.5 months of age, he had little spontaneous movement and was extremely stiff (video 1). EEG at presentation while on phenobarbital demonstrated a background lacking normal mixture of frequencies and poorly formed sharps but no seizures. Brain MRI was unremarkable. Exome sequencing of patient IV-6 revealed no mutations in known disease-causing genes. However, a homozygous nonsense variant of unknown significance in ATAD1 (c.826 G>T, p.E276X) was reported (figure e-1A). His parents each carried 1 copy of the change. The variant was classified as having a potential relationship to a disease phenotype. There are no previous reports of ATAD1 mutations in humans; however, mice harboring mutations in ATAD1 have frequent seizures, hypertonia, and early death.7 Compound heterozygote variants of unknown significance were also found in SZT2, which causes autosomal recessive epileptic encephalopathy type 18; however, the variants did not segregate in his affected sister (IV-5) and he did not fit this phenotype (supplemental results). SNP analysis confirmed that the family was consanguineous (table e-1). Patient IV-6 was found to have a de novo 1.25 Mb duplication of 17p13.3 (for more details, see supplemental results). Overlapping duplications have been reported with variable phenotypes including mild dysmorphic features, learning disability, hypotonia, autism spectrum disorder, and mild brain abnormalities.11 This duplication was not present in affected individuals IV-3 or IV-5. Furthermore, given the extreme hypertonia and early respiratory failure seen in individual IV-6, we did not feel that this could fully explain his phenotype. The effect of the p.E276X variant on ATAD1 expression was investigated in lymphoblastoid cells derived from the patient and an unaffected control. ATAD1 messenger RNA expression was decreased by 78% in p.E276X cells. This degree of reduction is consistent with nonsense-mediated decay,13 as noted by the absence of Thorase protein on Western blotting (figure e-1B). Investigation of ATAD1 variation in control populations revealed that in the Exome Aggregation Consortium (exac.broadinstitute.org/gene/ENSG00000138138) database, only 3 loss-of-function variants were observed in the gene, while the expected number of loss-of-function variants is 14.9. This suggests selection against loss-of-function mutations in ATAD1. Evaluation of perampanel as a therapeutic approach. Given that the p.E276X variant tracked with disease, decreased ATAD1 expression, and that ATAD1 knockout mice died of seizures, we concluded that this mutation was likely pathogenic. ATAD1 mutations increase AMPA receptor–mediated excitatory signaling due to impaired receptor recycling.7 Considering this mechanism of disease, we hypothesized that perampanel,14,15 a noncompetitive AMPAR antagonist could have therapeutic benefit. Therefore, we investigated the efficacy of perampanel in ATAD1−/− mice. Perampanel dosing in mice was based on prior studies8 and a dose escalation study (figure e-2). Ex vivo brain MRI of ATAD1−/− mice (figure 2A) demonstrated a volume reduction in all areas examined as compared to controls. Perampanel treatment did not show significant prevention of volume loss; however, there was a trend toward improvement (figure 2B). Loss of ATAD1 was also associated with increased T2-signal intensity throughout the brain, which is indicative of brain pathology with increased fluid content (figure 2C). Perampanel improved whole-slice signal intensity in ATAD1−/− animals by 30.3% (95% confidence interval 11.3%–59.5%); further analysis of individual brain regions revealed improvement of signal intensity in the thalamus and striatum (figure 2D). (A) Representative ex vivo brain MRIs of wild-type and ATAD1−/− perampanel-treated and perampanel-untreated mice. (B) Untreated ATAD1−/− mice (light blue bars) demonstrated volume reduction in all brain areas measured as compared to ATAD1+/+ mice (black bars). Perampanel therapy (dark blue bars) was associated with a trend toward normalization of brain volumes. (C) Whole-slice T2 MRI signal intensity was significantly increased in ATAD1−/− mice. This change was reversed with perampanel therapy. 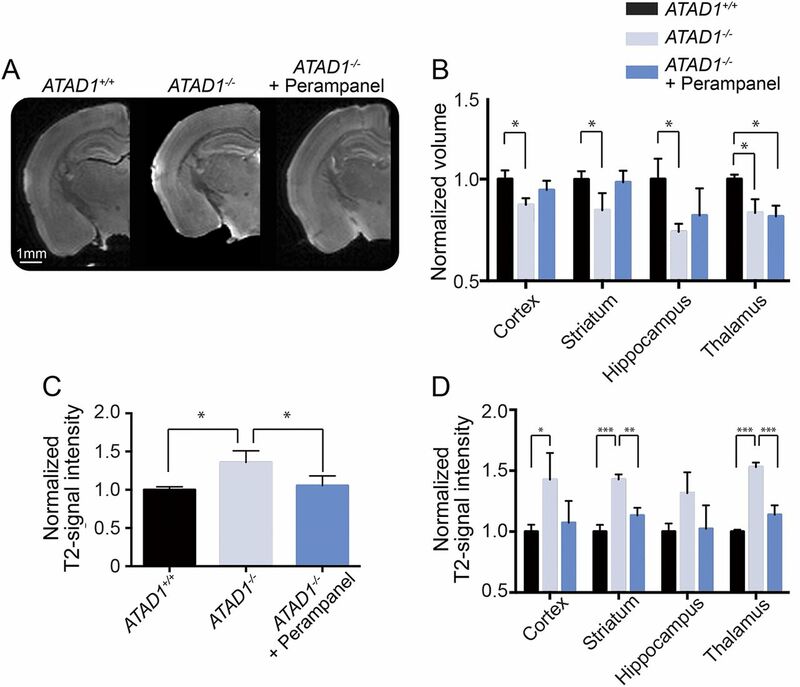 (D) T2-signal intensity was increased in ATAD1−/− mice throughout the brain. Perampanel therapy normalized signal intensity in the striatum and thalamus. For all panels, n = 6. *p = 0.01–0.05, **p = 0.001–0.009, and ***p < 0.001. On open-field activity testing, ATAD1−/− mice showed both an abnormal activity pattern as compared to wild-type mice (figure 3, A–H) and decreased spontaneous movements as measured by the distance traveled and the total rest time (figure 3, I and J). Perampanel corrected these behavioral deficits, while phenobarbital, an antiepileptic that targets γ-aminobutyric acid (GABA) receptors rather than AMPA receptors, did not. ATAD1−/− mice showed no difference in rearing activity or average speed as compared to wild-type littermates (figure e-3). Extensive daily observations revealed that ATAD1−/− mice would have seizures on the day that they died. Video recording revealed that 5 of 5 vehicle-treated, as compared to zero of 5 perampanel-treated, ATAD1−/− mice demonstrated seizures (video 2). Finally, perampanel significantly prolonged average survival in ATAD1−/− mice by 115% (mean of 20 vs 43 days), while phenobarbital did not significantly increase survival (figure 3K). These results demonstrate the efficacy of targeted AMPAR blockade by perampanel in mice with impaired AMPAR endocytosis due to mutations in ATAD1. (A–H) Perampanel, but not phenobarbital, normalized open-field assessments in ATAD1−/− mice as seen by quantification (A–D) and representative pathview images (E–H) from (A, E) vehicle-treated, ATAD1+/+, (B, F) vehicle-treated, ATAD1−/−, (C, G) perampanel-treated, ATAD1−/−, and (D, H) phenobarbital-treated, ATAD1−/− mice (n = 6). Open circles represent peripheral activity; closed circles represent central activity. (I and J) On behavioral analysis, ATAD1−/− mice (red diamonds) cover less distance (L) and rest more (M) than their wild-type littermates (black filled-in circles). Perampanel (blue triangles) reverses the movement deficits, while phenobarbital does not (n = 6). Two mice in the ATAD1−/− perampanel and phenobarbital-treated groups seized during this observation. The seizures were characterized by high-speed involuntary movements; therefore, they are shown in the figure (symbol surrounded by a black circle), but they are not included in the statistical analysis. (K) Survival is prolonged from 20 days in vehicle-treated ATAD1−/− mice (red line) to 43 days in ATAD1−/− perampanel-treated mice (blue line). There is no statistical survival difference between ATAD1−/− mice treated with vehicle (red line) or phenobarbital (green line). For all panels, *p = 0.01–0.05, **p = 0.001–0.009, and ***p < 0.001. See also figures e-2 and e-3. Given the efficacy of perampanel in mice, we next considered a therapeutic trial in patients with ATAD1 mutations. Perampanel was recently approved by the FDA for the treatment of seizures and demonstrated minimal off-target toxicity in human studies15; we obtained permission for off-label compassionate use for treatment of affected individuals. 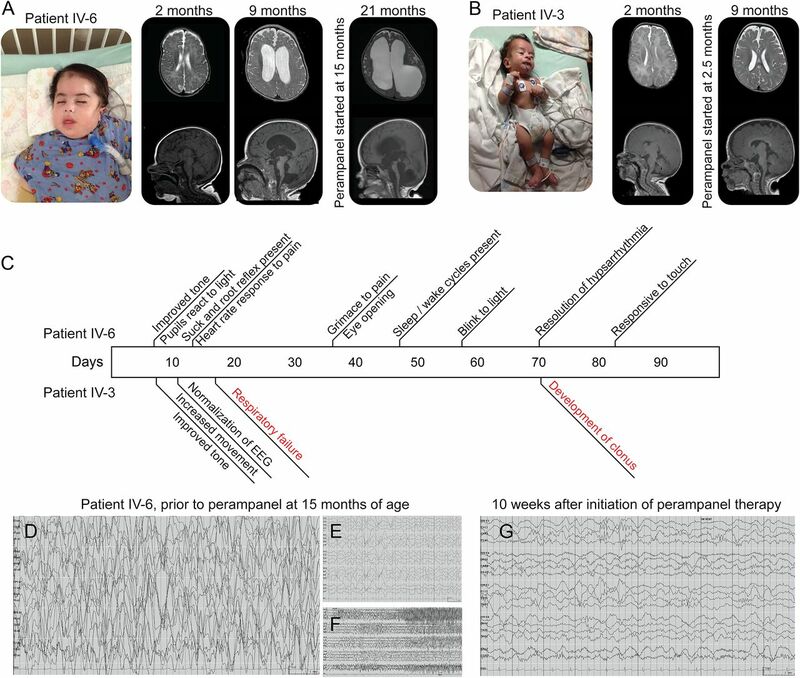 Patient IV-6 was started on perampanel at 16 months of age; at this time, he had severe brain atrophy on MRI (figure 4A), hypertonia, absent cranial nerve reflexes, no spontaneous respiratory drive, and hypsarrhythmia on EEG. Within 8 days of starting perampanel, his tone improved and he developed a pupillary response to light. He continued to show dose-dependent neurologic improvement until his neurologic status plateaued at a dose of approximately 0.5 mg/kg/d (figures 4C, e-4, e-5). He also had resolution of hypsarrhythmia on EEG (figure 4, D–G). He was weaned off all nonperampanel antiepileptics, which included phenobarbital (dose at start of trial 6 mg/kg/d), topiramate (dose at start of trial 6 mg/kg/d), and valium (dose at start of trial 0.9 mg/kg/d). Despite therapy, he continued to have severe neurologic deficits and worsening hydrocephalus requiring endoscopic third ventriculostomy. (A) Photographs and brain MRIs of the proband, individual IV-6. Initial brain MRI at 2 months showed normal parenchyma, but subsequent studies at 9 and 21 months showed progressive volume loss and hydrocephalus. (B) Photographs and brain MRI of patient IV-3. Brain MRI at 2 months of age was normal. Perampanel was started at 2.5 months of age and follow-up MRI at 9 months of age showed no changes (unlike the progressive neurodegeneration seen in untreated patient IV-6 over the same age range, panel A). (C) Timeline of clinical improvements observed in patient IV-6 and patient IV-4 after the initiation of perampanel therapy. Patient IV-4 also had progression of disease (marked in red) including respiratory failure that was not prevented with perampanel. The bottom panel shows an EEG recorded from subject IV-6 at 15 months of age, prior to therapy with perampanel. (D) Hypsarrhythmia is seen on EEG (gain = 7 μV/mm). (E) The pretreatment recording from panel A is shown at a gain of 30 μV/mm. (F) An example of one of many focal seizures captured on routine EEG prior to perampanel. The lower panel shows the EEG of the same patient 10 weeks after starting perampanel. (G) While on perampanel, the hypsarrhythmia resolved and no focal seizures were noted on follow-up 60-minute routine EEG. This improved EEG pattern was noted on all subsequent follow-up EEGs recorded over a several month period of observation. See also figure e-4. In light of the clinical improvement seen in the proband, patient IV-3 was started on perampanel at 2.5 months of age. Given his young age, his neurologic function was more intact as compared to his cousin's at the start of therapy. While he was profoundly hypertonic, he had normal cranial nerve reflexes and respiratory drive. After starting perampanel, he had rapid improvement in tone and normalization of his EEG (video 1). Like his cousin, he was weaned from his other seizure medications including phenobarbital (dose at start of trial of 2.5 mg/kg/d). Repeat brain MRI at 9 months of age showed no parenchymal volume loss while on perampanel (figure 4B), a finding that is dramatically different from what was seen in the proband at age 9 months (figure 4A, middle MRIs). Despite these markers of improvement, he developed respiratory failure requiring intubation. However, his limited function was better as compared to his cousin who was untreated at the same age: he maintained all brain stem reflexes, sleep/wake cycles, the ability to withdraw and vocalize to pain, and spontaneous movements of all extremities (figure 4C, and supplemental information). Functional improvement was also measured using the functional status score, a validated pediatric outcome measurement.10 This outcome assesses 6 functional domains (mental status, sensory, communication, motor, feeding, and respiratory function), each on a scale from 1 (normal) to 5 (severely impaired), and a composite score is calculated. Fully functioning children receive a score of 6, while maximal impairment is assigned a score of 30. Over the course of therapy, patient IV-6 had a score improvement from 29 to 24 (figure e-4, A and B). Patient IV-4 began the trial with a functional status score of 19 and showed an initial improvement to a low score of 17. However, his overall functional score worsened despite therapy at 3–4 months of age due to his respiratory failure (figure e-4, C and D). At the end of the therapeutic trial, his functional status score plateaued at 23, as compared to his untreated cousin's score of 29 at the same age. This suggests that perampanel may improve functional outcomes but cannot completely prevent progression of disease. We describe a disorder of AMPAR recycling caused by mutations in ATAD1, a gene not previously known to cause human disease. Affected patients demonstrate hypertonicity, seizures, and early death. Targeted therapy with perampanel alters the pathogenic mechanism and provides benefit in both mouse models and patients. This case series demonstrates the power of combining genomic testing and variant analysis using animal models. In addition, we confirm that combining detection of variants in novel genes and an understanding of disease mechanisms can inform care of an individual. This effort has achieved a clinical diagnosis, improved understanding of AMPAR function, and suggested therapeutic options. As the first report of ATAD1-induced human disease, this work builds on previous observations that mutations that interrupt normal synaptic transmission can cause seizures.16,17 Postsynaptic receptor recycling is a known pathogenic mechanism in epilepsy; for example, mutations in KIF5A reduce postsynaptic expression of inhibitory GABAA receptors, reducing total inhibition and leading to seizures and encephalopathy.18 Unlike KIF5A mutations that decrease total inhibition, ATAD1 mutations increase the population of excitatory postsynaptic receptors. Ultimately, either mechanism can disrupt the delicate balance between inhibitory and excitatory signaling and induce seizures. As this is a new, ultra-rare disorder, there is limited understanding of its natural history. This makes evaluation of perampanel efficacy difficult. For example, patient IV-3 required tracheostomy despite treatment with perampanel. It is possible that therapy was initiated too late in the natural progression of the disease or at too low of a dose to prevent this outcome. Nonetheless, he had better preservation of neurologic function than the few known untreated family members at the same age. The superior functional status scores in our patient initiated at a younger age could be related to drug effect or due to interindividual variation. Furthermore, we used an open-label therapeutic intervention strategy. This raises the possibility that treating physicians could be biased as to effect. To offset this, we used independent evaluation by multiple physicians. Clearly, more work is needed to fully determine the efficacy of peramapnel in this syndrome and to elucidate the exact treatment paradigm to maximize outcomes. Recently, a second function of ATAD1 was reported; it acts as part of a quality control system for the mitochondrial membrane.19 It is unclear how this function may relate to the patients' phenotype; perampanel would not be expected to reverse deficits in this pathway. Despite the clear benefits of this individualized medicine approach, there is likely an intrinsic limitation to the maximal benefit of perampanel therapy in patients with ATAD1 mutations. The high doses required in this disorder also inhibit the more subtle modulation of AMPA receptor activity that is crucial for normal CNS functioning. This limitation is supported by the fact that although perampanel prolongs survival and stops seizures in ATAD1−/− mice, they still die at a younger age as compared to their wild-type littermates. 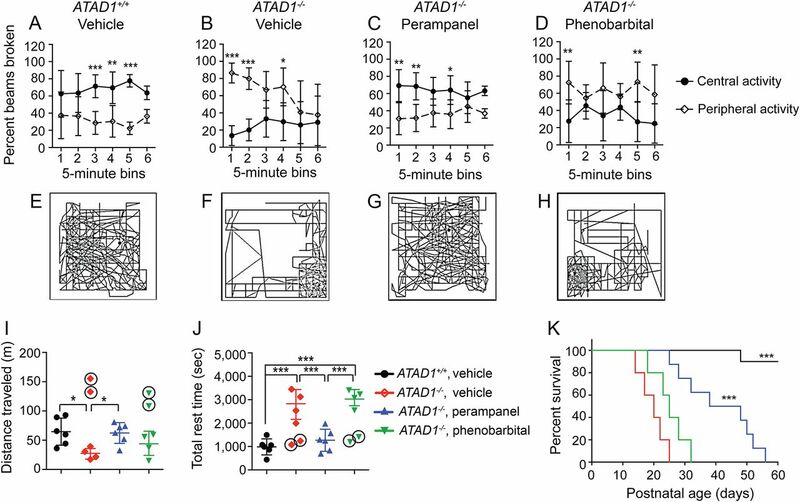 Mice and humans with mutations in ATAD1, a mediator of AMPA receptor recycling, manifest with a devastating neurologic disorder that responds to targeted therapy with an FDA-approved AMPA-receptor blocker, perampanel. These first studies establish the promise of this approach, but further studies are needed to elucidate both the natural history and the therapeutic potential of perampanel in patients with ATAD1 mutations. Designing research studies: R.C.A.-N., G.K.E.U., N.S., M.A.D., T.M.D., V.L.D., and E.D.M. Statistical analysis: R.C.A.-N. and G.K.E.U. Conducting experiments: R.C.A.-N., G.K.E.U., N.S., M.A.D., A.B.W., L.K.C., A.B.S., A.N., J.J., E.M., and E.D.M. Analyzing data: R.C.A.-N., G.K.E.U., N.S., M.A.D., A.B.W., L.K.C., A.B.S., A.N., J.J., E.M., T.M.D., V.L.D., and E.D.M. Writing the manuscript: R.C.A.-N. and G.K.E.U. Editing the manuscript: R.C.A.-N., G.K.E.U., N.S., M.A.D., L.K.C., J.J., T.M.D., V.L.D., and E.D.M. This work was supported by the NIH/NIDA DA000266 and NIH/National Institute of Neurological Disorders and Stroke R01 NS067525 and R37 NS067525 to T.M.D. and V.L.D., and NIH/National Institute of Neurological Disorders and Stroke R01 NS082761-01A1 to E.D.M. Dr. Ahrens-Nicklas has received research support from NIH. Dr. Umanah reports no disclosures. Dr. Sondheimer was an expert witness on behalf of Par Pharmaceuticals in litigation unrelated to this article. Dr. Deardorff and Ms. Wilkens report no disclosures. Dr. Conlin has served on the scientific advisory board of NIGMS Human Genetic Cell Repository SAC; has received speaker honoraria from Arcadia University; and has received research support from NIH/NHGRI and the Childtren's Hospital of Philadelphia. Dr. Santani has received speaker honoraria form Agilent; receives publishing royalties from Clinical Research Exome Agilent; has been a consultant for Invitae; has served on the speakers' bureaus of CHI, Biomarker, and World Diagnostics; has received research support from NIH; and has received royalty payments from Agilent. Dr. Nesbitt reports no disclosures. Dr. Juusola has been an employee of GeneDx. Ms. Ma reports no disclosures. Dr. Dawson has served on the scientific advisory board of CurePSP, the Bachmann-Strauss Dystonia and Parkinson Foundation, the Michael J. Fox Foundation for Parkinson's Research, the Milken Institute Parkinson's Disease Scientific Advisory Group Accelerating Medicines Partnership (AMP), the Foundation for the NIH, Technical Working Group Scientific Program Executive Committee, and International Association of Parkinsonism and Related Disorders (IAPRD); has received a speaker honorarium for “Molecular Underpinnings of Parkinson's Disease: A New Path for Therapies”; has served on the editorial boards of Biology and Chemistry of Nitric Oxide, the International Journal of Molecular Medicine, Molecular Neurodegeneration, Proceedings of the National Academy of Sciences, USA 2007, Current Chemical Biology, The Open Neuroscience Journal, ASN Neuro, the American Journal of Clinical Neurology, Cell, the Journal of Clinical Investigation, Parkinson's Disease, PLoS One, the Journal of Parkinson's Disease, the American Journal of Neurodegenerative Disease, Synapse, F1000 Research, Molecular & Cellular Oncology, Scientific Reports, and Oncotarget; holds the following patents: #S5266594—Inhibition of nitric oxide synthase and use thereof to prevent glutamate neurotoxicity; #S5587384—Inhibitors of poly (ADP-ribose) synthetase and use thereof to treat NMDA neurotoxicity; #5,898,029—Direct influences on nerve growth of agents that interact with immunophilins; #S5798355—Inhibitors of rotamase enzyme activity; #S5843960—Inhibitors of rotamase enzyme activity; #S5846981—Inhibitors of rotamase enzyme activity; #SRE036397—Inhibitors of poly (ADP-ribose) synthetase and use thereof to treat NMDA neurotoxicity; #6022878—Inhibitors of rotamase enzyme activity; #6,080,753—Stimulating nerve growth with immunophilins; #6,358,975—Method of using selective PARP inhibitors to prevent or treat neurotoxicity; #6,362,160—Immunophilin-binding agents prevent glutamate neurotoxicity associated with vascular stroke and neurodegenerative diseases; #8603994—Transcriptional repression leading to Parkinson's disease; PCT/US10/4487—LRRK2-mediated neuronal toxicity; 13/294,938—Compounds and related methods for manipulating PARP-1-dependent cell death; 13/294,884—The treatment and prevention of pathologic conditions using iduna and—related techniques and compositions; long-acting GLP-1R agonist as a therapy of neurological and neurodegenerative conditions; US 9,274,128 B2—Transcriptional repression leading to Parkinson's disease; and US 9309208B2—Methods of making and using thioxothiazolidine and rhodamine derivatives as HIV-1 and JSP-1 inhibitors; receives publishing royalties from Elsevier and Informa Healthcare USA, Inc.; has been a consultant for Valted LLC, American Gene Technologies International, Dong-A Pharmaceuticals, and SPARC; and has received research support from AbbVie Pharmaceuticals, Dong-A ST Pharmaceuticals, NIH/National Institute of Neurological Disorders and Stroke/NCBI, the JPB Foundation, the Diana Helis Henry Medical Research Foundation, the Adrienne Helis Malvin Medical Research Foundation, and the Michael J. Fox Foundation. Dr. Dawson has served on the scientific advisory boards of the New York Stem Cell Foundation and the Burke Medical Center Advisory Board; has received travel funding from the Salk Institute, the Gordon Research Conference, the University of Rochester, Novartis, Delaware Biotechnology Institute, Georgetown University, and the University of California San Francisco; has served on the editorial boards of the Journal of Neuroscience, NeuroMolecular Medicine, the Journal of Parkinson's Disease, Molecular & Cellular Oncology, Oncotarget, the Journal of Molecular Medicine, Neurobiology of Disease, and Nitric Oxide; holds the following patents: S5266594—Inhibition of nitric oxide synthase and use thereof to prevent glutamate neurotoxicity; S5587384—Inhibitors of poly (ADP-ribose) synthetase and use thereof to treat NMDA neurotoxicity; SRE036397—Inhibitors of poly (ADP-ribose) synthetase and use thereof to treat NMDA neurotoxicity; 6,358,975—Method of using selective PARP inhibitors to prevent or treat neurotoxicity; 6,362,160—Immunophilin-binding agents prevent glutamate neurotoxicity associated with vascular stroke and neurodegenerative diseases; PCT/US10/55,857—LRRK2-mediated neuronal toxicity; 8603994—Transcriptional repression leading to Parkinson's disease; and U.S. Provisional Application. Long-Acting GLP-1R Agonist as a Therapy Of Neurological and Neurodegenerative Condition; and has received research support from Inhibikase Therapeutics Inc., AbbVie, Sanofi, Dong-A ST, NIH/NIDA, NIH/National Institute of Neurological Disorders and Stroke, the Adrienne Helis Malvin Medical Research Foundation, and the Diana Helis Henry Medical Research Foundation. Dr. Marsh has served on the scientific advisory boards of Stanley Brothers Social Enterprises and the Jefferson University Cannabis Research and Education Center; serves on the editorial board of Epilepsia; and has received research support from GW Pharma, Zogenix Pharmaceuticals, Neuren Pharmaceuticals, and NIH. Go to Neurology.org/ng for full disclosure forms. Accepted in final form December 13, 2016.
. Clinical whole-exome sequencing for the diagnosis of Mendelian disorders. N Engl J Med 2013;369:1502–1511.
. Clinical whole exome sequencing in child neurology practice. Ann Neurol 2014;76:473–483.
. Molecular findings among patients referred for clinical whole-exome sequencing. JAMA 2014;312:1870–1879.
. Guidelines for investigating causality of sequence variants in human disease. Nature 2014;508:469–476.
. Standards and guidelines for the interpretation of sequence variants: a joint consensus recommendation of the American College of Medical Genetics and Genomics and the Association for Molecular Pathology. Genet Med 2015;17:405–423.
. Synaptic AMPA receptor plasticity and behavior. Neuron 2009;61:340–350.
. The AAA+ ATPase Thorase regulates AMPA receptor-dependent synaptic plasticity and behavior. Cell 2011;145:284–299.
. Perampanel: a novel, orally active, noncompetitive AMPA-receptor antagonist that reduces seizure activity in rodent models of epilepsy. Epilepsia 2011;52:1331–1340.
. Perampanel, an antagonist of α-amino-3-hydroxy-5-methyl-4-isoxazolepropionic acid receptors, for the treatment of epilepsy: studies in human epileptic brain and nonepileptic brain and in rodent models. J Pharmacol Exp Ther 2014;351:124–133.
. Functional Status Scale: new pediatric outcome measure. Pediatrics 2009;124:e18–e28.
. The duplication 17p13.3 phenotype: analysis of 21 families delineates developmental, behavioral and brain abnormalities, and rare variant phenotypes. Am J Med Genet A 2013;161A:1833–1852.
. Genetic linkage analysis in the age of whole-genome sequencing. Nat Rev Genet 2015;16:275–284.
. Organizing principles of mammalian nonsense-mediated mRNA decay. Annu Rev Genet 2013;47:139–165.
. AMPA receptors as a molecular target in epilepsy therapy. Acta Neurol Scand Suppl 2013;197:9–18.
. Preclinical pharmacology of perampanel, a selective non-competitive AMPA receptor antagonist. Acta Neurol Scand Suppl 2013;197:19–24.
. De novo mutations in the gene encoding STXBP1 (MUNC18-1) cause early infantile epileptic encephalopathy. Nat Genet 2008;40:782–788.
. A missense mutation in a highly conserved alternate exon of dynamin-1 causes epilepsy in fitful mice. PLoS Genet 2010;6:e1001046.
. Molecular motor KIF5A is essential for GABA(A) receptor transport, and KIF5A deletion causes epilepsy. Neuron 2012;76:945–961.
. Msp1/ATAD1 maintains mitochondrial function by facilitating the degradation of mislocalized tail-anchored proteins. EMBO J 2014;33:1548–1564.